Perhaps some will portray this as a rip of Nathan MacKinnon. Yet MacKinnon can’t be trying to be Jarome Iginla, Cam Neely or Brendan Shanahan in their primes as wingers, or other power forwards whose sharp-edged games were fueled by emotion, even anger, that often led to the dropping of the gloves. That was true whether it involved simple one-on-one battles or straying into the standing-up-for-teammates category. The Avalanche can’t afford to have MacKinnon, the 22-year-old center who still has a longshot chance of winning the NHL scoring title, fighting. That’s even before you get into the discussion of just when it became the fashion in the NHL to feel the need to react to clean hits — and react beyond simply giving credit where credit is due and looking for an opportunity to deliver a clean hit back in reply. There, I’m thinking of the types of hits Nikita Zadorov is prone to deliver, and the inevitability of the how-dare-you reaction. I get the notion of deterrence, of heading off “liberties.” There as a reason Dave Semenko was out there with Wayne Gretzky, of course. But there’s also a fine line. MacKinnon can hold his own, and more, in fights, and he did again Saturday. He saw the hit on Rantanen and I’ll concede he didn’t have the benefit of replays to decide it it was clean or at least sufficiently objectionable as he decided to “stand up” for his young Finnish linemate. It’s praiseworthy, even impressive humility. MacKinnon doesn’t think he’s above this. And all his teammates should know it. With all due respect to Rantanen (and MacKinnon), this wasn’t going to happen if roles were reversed. 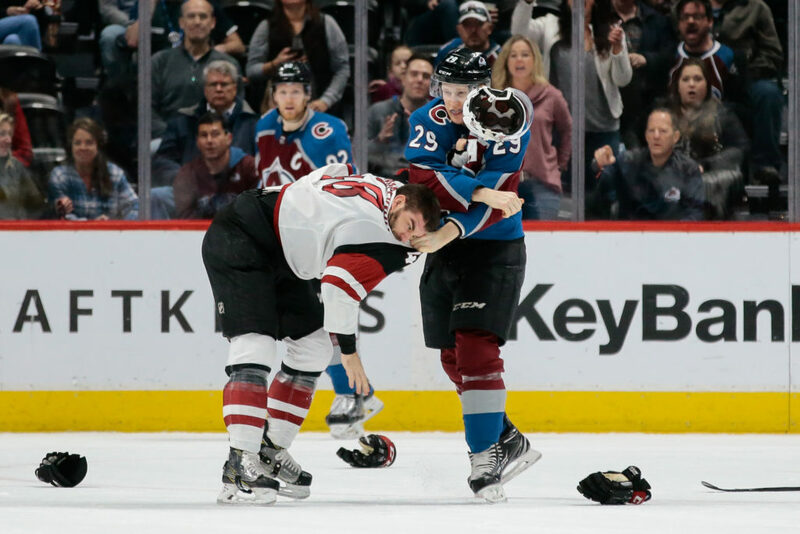 If a Coyote belted MacKinnon with a clean hit, Rantanen wasn’t going to go after the opponent and drop the gloves. And he shouldn’t. That’s just not Rantanen. As of Saturday night, MacKinnon, the Flyers’ Claude Giroux and the Oilers’ Connor McDavid were tied for third in NHL scoring, each with 81 points. (That was before McDavid and the Oilers’ late game against Minnesota.) The Lightning’s Nikita Kucherov led with 88 points and the Penguins’ Evgeni Malkin was next with 85. After the Avalanche pulled into the Western Conference’s second wild card spot by a point over the Los Angeles Kings, coach Jared Bednar voiced his ambivalence about MacKinnon’s reaction. “I certainly don’t want Nathan MacKinnon fighting, for obvious reasons,” Bednar said. “If something happens to him, he’s such a big part of our club that there’s too much at risk there. But I love the fact that he did fight and stood up for his teammate there. It’s part of what makes him so good, right? He’s a competitive guy, a highly competitive guy. He didn’t like what he saw, so he does that. As the coach, you’re just crossing your fingers and hoping for the best. Bednar conceded, “I don’t think it was a dirty hit. (Rantanen) cut to the middle, looking to make the play. Good players are going to take pucks in the areas where they make guys commit, and then look to do something with the puck that can create a scoring chance. I think that’s what Mikko was doing there. He just got caught in the train tracks and it was a hit, maybe a touch high, but it was a clean hit. Mikko was fine, bounced right back. Was it a dirty hit? There was some history here, too, since MacKinnon dropped the gloves and went at it with Josh Archibald during a chippy game at Glendale on Dec. 23, most notably when Zac Rinaldo delivered an unpenalized hit on MacKinnon and then reacted to Samuel Girard’s approach with a sucker punch to Girard’s face. Denver-based journalist Terry Frei writes two commentaries a week about the Avalanche for Mile High Sports. He has been named a state’s sports writer of the year seven times, four times in Colorado (including for 2016) and three times in Oregon. He’s the author of seven books, including “March 1939: Before the Madness,” about the first NCAA basketball tournament and its champions; and “Horns, Hogs, and Nixon Coming,” about the landmark 1969 Texas-Arkansas football game and the events swirling around it. His web site is terryfrei.com and his additional “On the Colorado Scene” commentaries on subjects beyond the Avalanche are at terryfrei/oncolorado.